The PS520 mounts on both sides of the pallet conveyor to minimize floor space requirements. Pallet loads are located in the conveyor flow direction with a set of positive stop gates. 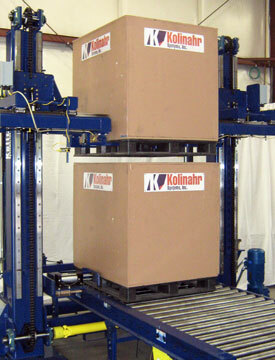 A pneumatic alignment system locates the pallets in a consistent position in the cross-conveyor direction. The Pallet Load Stacking Equipment uses pneumatic slide arms to grab the pallet and lift it with an electric motor. The machine is controlled by a PLC, which can communicate with the conveyor, stretch wrapper, and palletizer, making it an integral part of the packaging line. By tracking pallets via a data stream provided from the palletizer, non-matching or partial pallets are allowed to pass through. The PS520’s heavy-duty, two-post steel frame delivers maximum stability and quick installation, and is ideal for high volume warehousing operations where space is at a premium.